The Federal Highway Administration’s Bridge Inspector’s Reference Manual (BIRM) is a comprehensive manual on programs, procedures, and techniques for inspecting and evaluating a variety of in-service highway bridges. BIRM serves as the basis of a comprehensive National Highway Institute training program in bridge-safety inspection. The present course is based on BIRM’s Section 4, Bridge Inspection Reporting System, and discusses 1) structure inventory, 2) condition and appraisal, 3) record keeping and appraisal, 4) the inspection report, and 5) AASTO commonly recognized (CoRe) elements. This course is intended primarily for civil, construction, and structural engineers, and would be of particular interest to consulting engineers or to engineers serving in government organizations concerned with the safety of bridges. This course includes a true/false and multiple-choice quiz at the end, which is designed to highlight the general concepts of the course material. 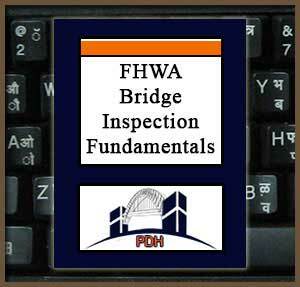 This course is based on Section 3 (Fundamentals of Bridge Inspection) of the Federal Highway Administration Bridge Inspector’s Reference Manual, Publication No. FHWA NHI 03-001, October, 2002, Revised December, 2006.